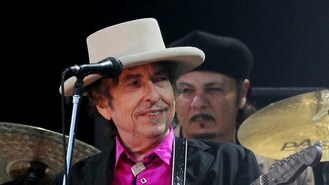 Bob Dylan has been sued by a Croatian community, who have accused him of racism over comments he made over a year ago. Representatives from the Council of Croats in France (CRICCF) have filed a complaint in connection with an interview the 72-year-old rocker did with Rolling Stone, where he likened the Croatians to Nazis, reported the International Business Times. CRICCF secretary general Vlatko Maric said: "It is an incitement to hatred." The group have named Bob as a defendant, along with Rolling Stone's French publisher. "You cannot compare Croatian [war] criminals to all Croats. But we have nothing against Rolling Stone magazine or Bob Dylan as a singer," he added, saying they are seeking an apology from the artist. The Blowin' In The Wind star, who was a prominent supporter of the US civil rights movement, caused controversy with his remarks as he spoke about parallels between the 1860s and present-day America. "The US is too f***ed up about colour. It's a distraction. People at each other's throats just because they are of a different colour. It's the height of insanity, and it will hold any nation back - or any neighbourhood back," he said. "If you got a slave master or Klan in your blood, blacks can sense that. That stuff lingers to this day. Just like Jews can sense Nazi blood and the Serbs can sense Croatian blood," Bob added. Bob, who was awarded France's prestigious Legion of Honour in November, played gigs in Belgrade, Serbia and the Croatian capital of Zagreb in 2010. He also performed in Belgrade for a concert in 1991, before Croatia declared independence from Yugoslavia in 1995 after a four-year war. Rebecca Ferguson has revealed she was not completely happy with her first album, and admitted fame changed her at first. Prince has been announced as the headline act at Essence Festival in New Orleans next year. French authorities have filed preliminary charges against Bob Dylan over a 2012 interview in which he is quoted comparing Croatians to Nazis and the Ku Klux Klan. One Direction are revealed as the stars with which the nation wants to spend the next 12 months, after topping the best-selling calendar list. Little Mix have promised an "unforgettable" time as they head out on their biggest UK tour to date. Green Day have said they will be taking a break to recharge after finishing their 2014 Australian tour. Miley Cyrus has said that in her opinion, Pharrell Williams has been the best entertainer of 2013. Este Haim has revealed she hasn't managed to learn to sleep on the road. The names of the defendants in the case of disgraced rock star Ian Watkins were mistakenly included on the court service's listing site, it has confirmed.